Ignacio Huang as Kevin “El Chino” in the Venezuelan comedy ‘El Peor Hombre de Mundo (The Worst Man in the World)’. With Venezuela in the midst of economic and social meltdown, “El Peor Hombre de Mundo (The Worst Man in the World)” might seem about as far removed from the average Caraquenian experience as imaginable. Released at the end of 2016, this corny comedy depicts the travails of a serial philanderer on a trail of redemption. Bars, swank penthouse parties and chummy workouts in tranquil parks serve as backdrops to flashbacks punctuating that introspection. It’s a depiction of Caracas that seems scarcely credible and one that might seem inappropriate given the facts on the ground: murder and, now, near mayhem. Certainly some local critics were far from impressed with what they saw. “A neutral Caracas,” sneers one. Indeed. So, how does one reconcile these scenes of upper middle class languor with the reality of a city that has become synonymous with danger and, more broadly, with the images of starving hordes spilling over the borders with Colombia and Brazil that have become a dismaying mainstay of reports from the region? The Taiwan-born Argentine actor describes surreal shopping experiences in Caracas’ threadbare supermarkets. So, what of well-heeled Caracas? Does it really exist? Ladies men: Huang and costar Alexander Da Silva. “Of course it’s there,” says Huang. “In all the poorest places in the world, there is another side. I was taken to parties in the wealthy, safe zones on the other side of the hills.” As with other South American cities, such as Rio, the hills in question are home to some of the worst slums on the planet. Yet, for a select – albeit increasingly trepidatious – elite, fines wines, exclusive golf clubs and Buddha Bar get-downs help dress the smudged window onto the festering ghettoes. “I saw designer handbags for sale that cost two months of a normal person’s salary,” says Huang. The decision to cast Huang as Kevin, who Juan dubs “the most exotic character in the city,” added another layer of incongruity to proceedings. “It’s almost impossible to see a Venezuelan man with a Chinese friend,” says Huang. “There are hardly any Chinese in Venezuela and most of them don’t speak Spanish.” Although Huang’s character is introduced as an Argentine immigrant, his casting still seems a bizarre choice. Huang disagrees. “It’s completely cohesive when you see his film is not talking about Venezuela now,” he says. If the movie itself sits uneasily with quotidian reality in Venezuela, the setting for this Taiwan “premiere” is no less jarring. We’re gathered in the communal movie room at a plush, gated community in Sanxia District (三峽區), New Taipei City (新北市), to watch what is the first screening of the movie outside of Latin America. Having proved a success domestically, the film was also shown at a film festival in the Dominican Republic. It has yet to be screened in Argentina, though Huang hopes to rectify that later this year with a rather more high-profile event than the current gathering for friends. We’re watching it courtesy of a private Vimeo link, which Huang says took him some time to wangle. 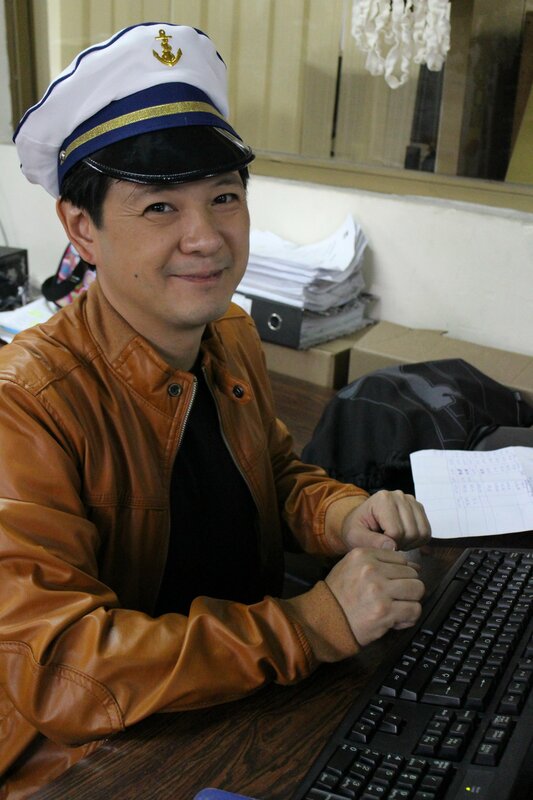 Playing the fool: Huang on set. The last time I saw him in Buenos Aires in summer of 2014, he was intense and passionate, yet filled with the nonchalance that one would expect of Porteño thesp. He returned to Taiwan for the first time in more than 30 years last year and is back again this year at least until August. This afternoon, he’s guinea pig skittish as he introduces the movie and we try to get the laptop hooked up to the sound system. Eventually, staff are called to resolve the issue. Next, there’s a lag between the dialogue and the English subtitles – for one or two Spanish-speaking members of the group, this issue is compounded by the heavy Venezuelan twang that they say is barely comprehensible to Argentine ears. Finally, things seem to smooth themselves out and we enjoy the film. Huang’s jitters are understandable. He has yet to see the film himself. As he explains, the producers were unable to fly him over for the premiere in Caracas in December. He thinks the worsening social crisis played a role, but says the main factor was probably budgetary constraints. 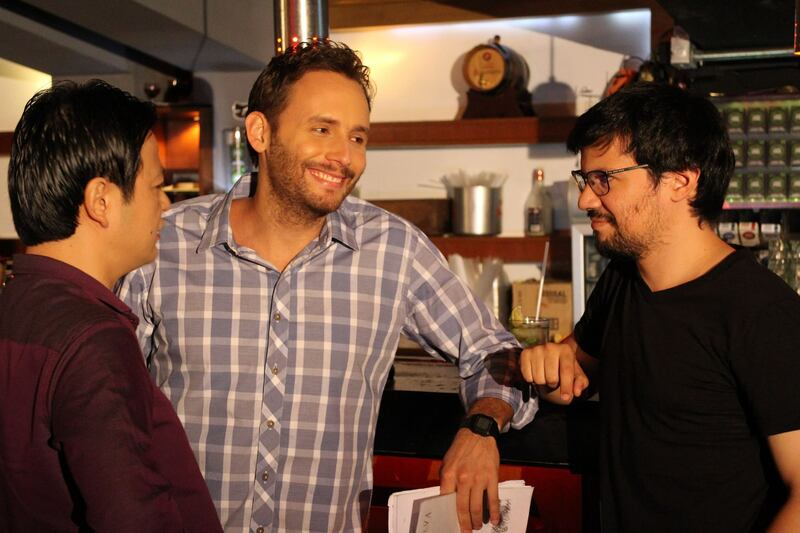 Huang, Da Silva and director Edgar Rocca on set. The movie is enjoyable enough, though filled with stereotypes and a rather convenient, cringe-worthy resolution. Perhaps the most interesting aspect of the film is the main character’s aspiration to be a screenwriter. However, the frequent references to master filmmakers such as Truffaut, Antonioni and Buñuel feel like little more than name-dropping and even an oneiric appearance by director Román Chalbaud – a legend of Venezuelan cinema – isn’t enough to convince you that this isn’t just an attempt to give a bawdy comedy a high-brow sheen.